EVGA has unveiled its new iCX Technology Suite this week which features a total of 11 global patents (pending and granted), and offers nine additional sensors embedded on the PCB. Thanks to the newly designed diecast baseplate and backplate and the specifically designed directed airflow chambers, owners are capable of engaging in full control thanks to the EVGA Precision XOC, the EVGA iCX Technology Suite design to provide interactive cooling solutions. 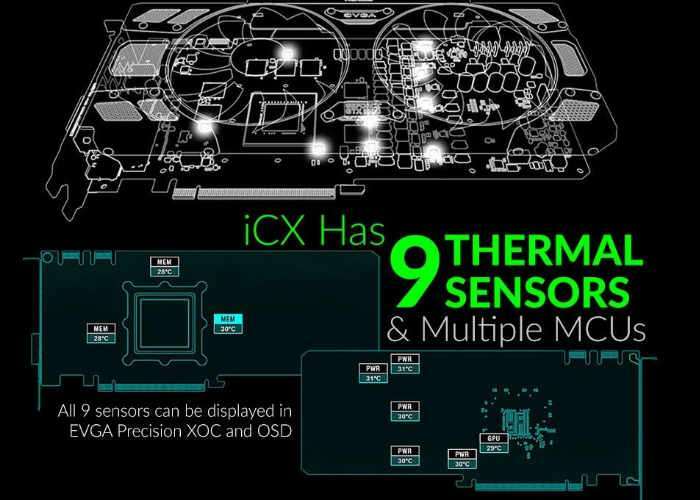 • EVGA iCX Has 9 Thermal Sensors and Multiple MCUs – All 9 sensors can be display in EVGA Precision XOC and OSD. • Full Control with EVGA Precision XOC – Each sensor can be monitored in real time and displayed in PXOC OSD. • Die Cast and Form Fitted Baseplate and Backplate – Makes direct contact with all vital components. Maximize heat dissipation with increased surface area on baseplate. • Peace of Mind Gaming – An EVGA ONLY fuse adds another layer of protection to your card and system.